Country music singer Jake Owen, who had just taken the stage at the Route 91 Harvest festival in Las Vegas as a gunman opened fire, said everybody was scared amid the chaos. Owen said he had just taken the stage with Luke Combs and other performers, who he described as his friends, and was just 50 feet away from headliner Jason Aldean when he first heard the gunshots. Owen said that he ran in the opposite direction of his tour bus and instead ended up behind a police car taking cover. Owen did eventually make it back to his tour bus, but he said the gunshots continued. According to a video posted late Monday morning, Owen was still on his bus across from the stage. He described getting back to his bus and having to climb over a fence. He said it was the “most horrific thing” he’s every experienced in his life. More than 50 people were killed and at least 400 injured when a shooter, identified as a 64-year-old man named Stephen Craig Paddock of Mesquite, Nevada, fired round after round from a high-rise room at Las Vegas’ Mandalay Bay Resort and Casino down onto a crowded country-music concert. He was found dead on the 32nd floor of the hotel with a cache of “in excess of 10 rifles,” Clark County Sheriff Joe Lombardo said. Watch Owen’s full interview with “Today” above. 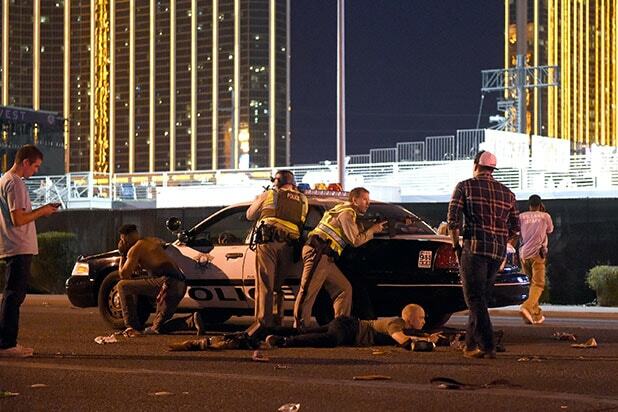 A gunman opened fire on Sunday night and has killed at least 50 people and wounded 400 more. It is now the deadliest mass shooting in modern U.S. history. People fled the scene from the packed Route 91 Harvest Festival, where Jason Aldean was performing. Concert goers after a gunman opened fire at the country festival. People outside of the Route 91 Harvest country music festival after reports of an active shooter. People on the grounds after a shooter opened fire from the 32nd floor of the Mandalay Bay hotel. People on the grounds after a shooter opened fire from the Mandalay Bay hotel. People flee the grounds after a shooter opened fire from the Mandalay Bay hotel. Police officers outside of the Route 91 Harvest Festival. The banner of the music festival. Broken windows were seen on the 32nd floor of the Mandalay Bay Resort, where the shooter was shooting from.